Jason Momoa Aquaman: everything you want to know about the It-dude. Inside Jason Momoa's wild Hollywood love story and family life. He’s the flamboyant, testosterone-heavy star of DC’s comic’s new movie, Aquaman, but you may also recognise Jason Momoa from his role as Khal Drogo on HBO’s in Game of Thrones. Momoa was in Sydney this week, making an, ahem, splash, on the Aquaman press tour and movie premiere. During the premiere, Momoa lead an impromptu performance of the traditional Haka; but it was his attendance with his family – love-of-his-life wife Lisa Bonet and children Lola, 11, and Nakoa-Wolf, 10 – which really got people’s attention. Which is why we thought you’d like to know a bit – or a lot – more about him. Read this, and consider yourselves informed. Ok, so before we get to his amazing love story with Bonet, you need to know about Momoa’s background. He’s 39, and was born in Hawaii. He’s now an actor, writer, film producer, director and model. He is known for portraying Aquaman in the DC Extended Universe, beginning with the 2016 Batman v Superman: Dawn of Justice and the 2017 Justice League. Before that, he played Drogo in Game of Thrones from 2011–2012. And waaaaay before that, Momoa won Hawaii’s Model of the Year 1999. At 19, he was cast in Baywatch Hawaii. The American actor met 51-year-old Bonet (who played Denise in the Cosby Show) in 2005, but his interest in her started long before that. “Ever since I was 8 years old and I saw her on TV, I was like, ‘Mommy, I want that one!&apos;” Momoa shared on The Late Late Show, revealing that his crush on Bonet began when she was on The Cosby Show. Why Momoa is tight with Lenny Kravitz. Bonet is also mother to actress Zoë Kravitz, 30, from her first marriage to iconic American singer, Lenny Kravitz (from who she split in 1993). Which of course makes Momoa Zoë’s step father. Momoa made headlines this month when he posted Instagram photos of the matching skull-shaped, carved-bone friendship ring he gave to Kravitz. “They were divorced 15 years before I even showed up. We’re awesome. He’s an amazing dad. And Zoë is like my daughter,” Momoa said. Other Momoa facts you need to know. “I don’t want to be an actor that plays music,” Momoa said. Momoa has several tattoos. He has a half sleeve featuring nine rows of black triangles encircling his left forearm – his Hawaiian family’s crest, the manō. The triangles represent shark teeth. On his right outer forearm, Momoa has a tattoo which reads “Être toujours ivre”, roughly translating from French as “Always be drunk”. On his right inner forearm, Momoa has a tattoo which says “Pride of Gypsies”, which is the name of his film and commercial production company. The actor also has a memorial tattoo on his middle right finger, which reads “Diablo”, in memory of his best friend who passed away in 2013. Lastly, Momoa has the signatures of his two children, Lola and Wolf, tattooed over his left pectoral in red ink. “It tones down the testosterone,” Momoa has said. 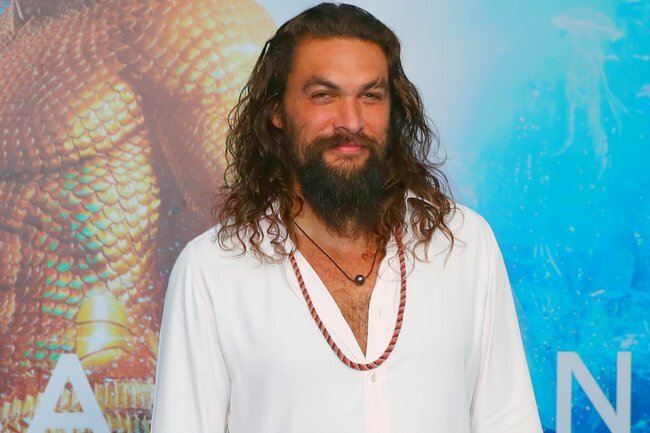 It’s a not-very-Aquaman-like preference – but it sums up Momoa’s free-spirit perfectly, and explains exactly why the world is in love with him right now.